"Admiral Jelly" redirects here. If you were looking for the boss in the DS version, see here. 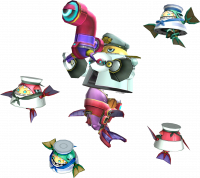 Admiral Jelly is the boss of Aquarium Park in Sonic Colours (Wii). It is a repeat of the Sweet Mountain Boss, instead using a ship that looks like a shark. One difference here is that the switch is now encased in glass, which needs to be destroyed to hit it and cause the ship to fall. The other difference is that you fight in the water after being on the ship. 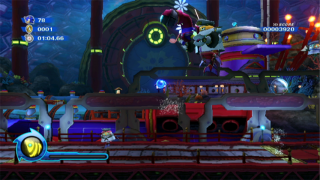 The boss also moves all around the arena, so using the Sonic Boost is harder on this boss. The Yellow Wisp Drill power can be used again if found, so find it and use it to easily take down this boss and gain more points.